Cette maison à mi-île dispose d'un espace ouvert et aéré rencontre avec le salon / salle à manger / cuisine ouverte dans une véranda, le tout avec la flambée des plafonds cathédrale. La véranda et une terrasse sont accessibles à partir des portes-fenêtres des deux salles de séjour et salle à manger. La chambre principale a une salle de bain privée et les autres chambres ont une salle de bain attenante entre eux. La cuisine est bien équipée pour tous vos besoins de cuisson et à la fois un gaz et charbon de bois sont disponibles. La plage est à cinq minutes à pied de la maison et il ya une douche extérieur idéal pour rincer le sable chaque fois que vous revenez. Linge de maison ne sont pas fournis, mais peuvent être loués à partir de Location de Julie sur l'île et peuvent être livrés avant l'arrivée. Alors que les clients doivent fournir leur propre produits de papier et de fournitures de nettoyage, un balai, une vadrouille et un aspirateur sont fournis. Aussi les lits sont meublées avec matelas, oreillers et couettes. Le tarif de location comprend un service de ménage fourni à la fin de votre séjour, sauf pour les locations de moins de 5 nuits. Sunset Beach est l'île la plus méridionale de la barrière en NC avec de larges plages de sable protégées par des rangées de dunes spectaculaires. Il a été classé n ° 4 par National Geographic comme l'une des 21 meilleures plages du monde en 2017, et a fait de TripAdvisors une liste de vacances à la plage. Ce est une plage familiale orientée plus relaxant, avec seulement quelques points de vente de faible hauteur, mais à proximité des nombreux équipements de Myrtle Beach. Juste à côté de l'île, il ya également de nombreux restaurants, magasins et autres points de loisirs, ainsi que plusieurs golf de classe mondiale de golf. Juste une courte promenade sur la plage, Bird Island, une réserve faunique nationale, se compose d'un brin de deux mile de la plage inhabitée (sauf pour les nombreuses espèces d'oiseaux, des cerfs, des chèvres et tortues) pour rendre votre pied ou à vélo encore plus agréable . Perfect spot for a long weekend getaway! The house was in a great location and was so convenient. We could walk to the beach, the pier, and the little shops on the island. The house was clean. It wasn’t anything super fancy but was perfect for the short vacation! There was even a pack and play for my baby to sleep in so I didn’t have to pack one! It was also nice to have the outside shower to shower after the beach. It was also great to have the grill and other kitchen supplies to use! Just make sure to pack sheets, toilet paper, and your own soap. We were very pleased and Chuck was so helpful and friendly! We will definitely be back again! Sheer delight was perfect for our "too-short" vacation. The high ceilings and open space, with the tall windows offered the feeling of home and room to move around. The kitchen was abundantly stocked too. We loved having coffee on the screened porch. The outside shower was a needed luxury when we got back from the beach. Owners' communication was excellent! You will love this perfect beach retreat. The house was perfect for our group of four. Short walk to a beautiful beach, the pier, or the marsh. The layout of the house allowed us to make dinner while enjoying each other. Quiet and comfortable. The house was equipped with all the essentials. Chuck was very helpful and kind. A wonderful week of great memories. We would love to return. What a great house! 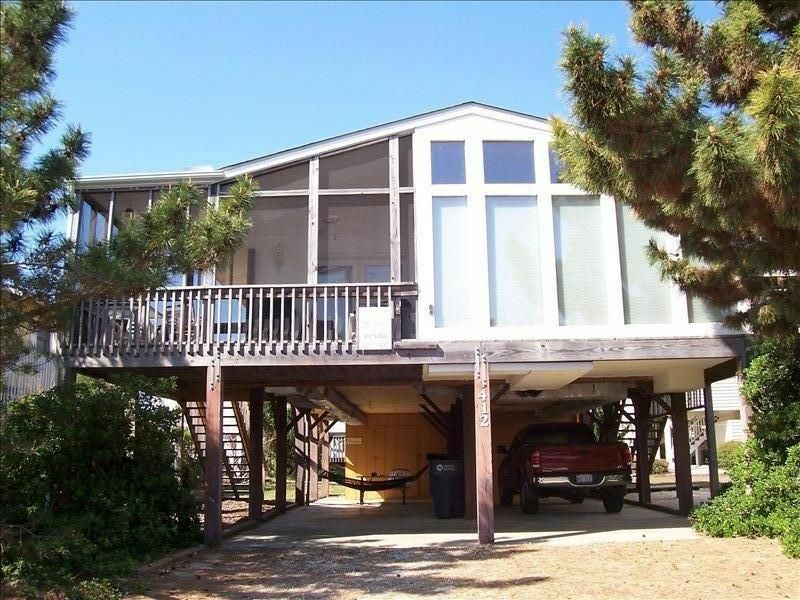 The home is the perfect size for my little family and is located close to beach access. The island is quiet and quaint. The kitchen has everything you could need. My favorite part of the whole house is the screened in porch with afternoon shade. I came home from the beach happy and well-rested. Thank you for a great week; we will be back. We had a great stay at Sheer Delight. The house was located in a very quiet neighborhood, and the owner was very helpful and quick to help me work through some issues that I had with booking through VRBO, and was helpful in answering general questions about the house. The only reason that I’m not giving five stars is that the living room furniture was more like outdoor furniture, and was not at all comfortable. Normally this wouldn’t matter to me, since being at the beach means spending most of the time outside, but it rained a lot during our trip, which forced us to be inside, and the living room furniture was really uncomfortable and hard to spend a lot of time on. Otherwise, almost everything else about the house was great. The mattresses in the main bedrooms were comfortable and it was nice being able to sit on the screened in porch to enjoy the outdoors when we couldn’t be outside due to the rain. The mattress on the top bunk bed could have been a little more comfortable. The location was great, easy access to the beach, to the stores on the island and to the bridge that takes you off of the island. If I decide to take another trip to Sunset Beach, I’ll definitely consider another stay at Sheer Delight! First I am sorry the weather made you stay in on the "uncomfortable" cushions. I hope you do come back to "Sheer Delight" as the cushions should be broken in by next year. We had them custom made and they are brand new and will soften over use. The original cushions had gotten too soft and I guess we over did it on having the new ones made firm!